When a remote service needs to call your application and you don't want (or can) deploy your application to a public server. For debugging purposes, it's better to keep everything local. When you're testing mobile apps and you want to expose your local server as the back-end. When you want to make a quick demo of your app to a client/user in another part of the world. When you want to publicly expose something, like an email server or a file repository from your private network. Having said that, we'll take a quick look at each option using a Hello World Express app. If you want to skip this and go directly to the comparison table, click here. This is the easiest service you can use to expose your local app to the world. In the words of the author, it was written to easily create a tunnel with no setup, as a library first, and a CLI tool second. Don't confuse it with the original localtunnel that apparently, was discontinued in favor of ngrok. By default, the URL will have the domain localtunnel.me with a subdomain composed of random characters. This URL will change every time you rerun the process. Ngrok is the most popular service of all these. 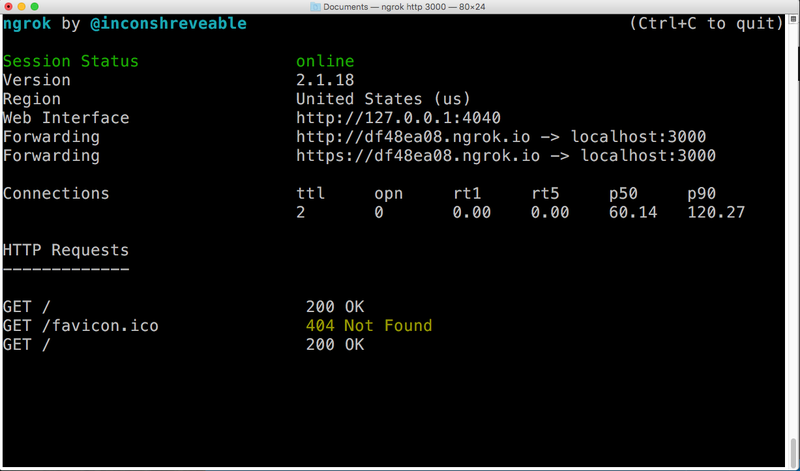 Like localtunnel, ngrok creates a secure tunnel to a local server on your machine. Ngrok is built in Go so it has binary packages for each major platform. You just have to download a ZIP file, unzip it, and then run it from the command line. That's the recommended way to install it, however, there's also a Node.js wrapper for ngrok that downloads the ngrok binaries for your platform. However, this is only available as a paying customer. It also supports custom domains. Among other things, you can configure all the ngrok options of the command line with a YAML file, and it also has a REST API to manage tunnels, collect metrics, and replay requests. You can know more about this features at the documentation page, which is very complete. According to its website, Now allows you to deploy your Node.js or Docker-powered app to the cloud with ease, speed, and reliability. This can give us a hint at the fact that Now uses a different approach than the previous services. Instead of creating a secure tunnel to your localhost, Now deploys you application to the cloud. You might think this belongs to another category, but the way you can make your application available online without using something like Git, and some features that are helpful for development, make Now enter this comparison. Using pre-built binaries for 64-bit systems. Using the Now Desktop app (only available for Mac), which also installs the Now CLI. Once installed, go to your app directory and type now. The first time you run this command, it will prompt for an email address to create an account and confirm it. Next, it will start deploying your app, creating a URL, and putting it on your clipboard. Now also supports custom domains and subdomains and it has a REST API to manage all the deployments under the account, domains, certs, aliases, and secrets for the authenticating user. Great, but which one should you use? If you are just doing a demo or some quick tests, go with localtunnel. You can install it with NPM and ask for the same subdomain every time. This helpful if you are setting the URL of your app in an external service. Without paying, you don't have to change it every time. If you are testing a webhook, the inspect and replay features of ngrok will be a big help. Also, some frameworks, such as the Microsoft Bot Framework, integrate very nicely with ngrok. If you are more interested in the hosting aspect, more than any development-related features, use Now. I hope you found this guide interesting. Thanks for reading.